Most organizations today leverage some sort of SaaS, PaaS, or IaaS as a part of their cloud computing strategy. However, far too many companies rely on the same network architecture to serve their users as they did when most services came out of their own data centers. 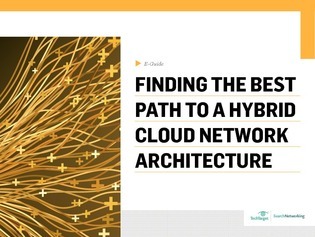 In this expert e-guide, we explore a variety of paths that can help lead your organization to a hybrid cloud network architecture. Learn whether SD-WAN, WAN cloud exchange, or some other option is best for your enterprise network.